Over the last several months, I’ve had a couple of opportunities to analyze a ceramic monolith. For me, this was interesting because I’ve never analyzed one of these and they have been around for a long time. Ceramic monoliths have been used for decades to support metal catalysts, providing a large surface area for reactants to interact with the catalyst. 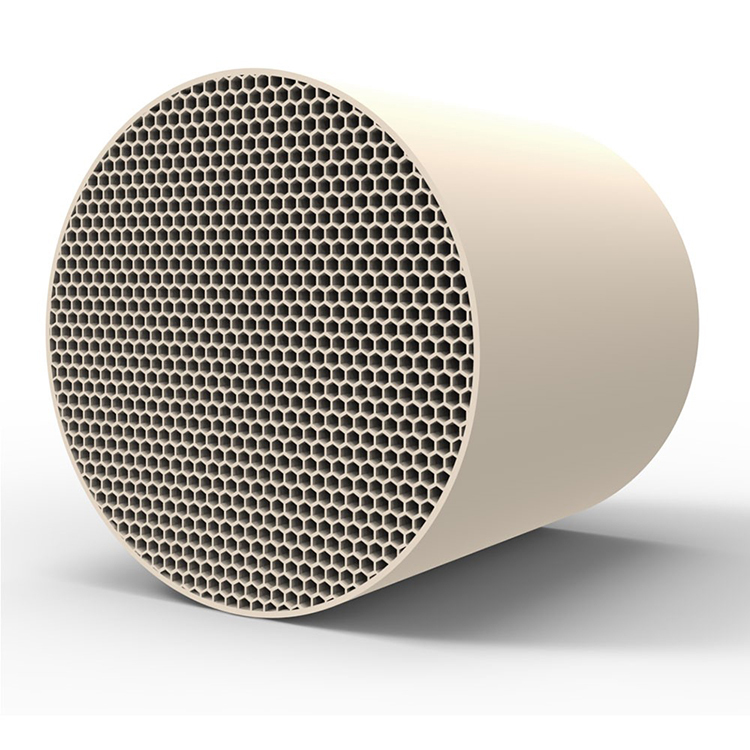 One of the most common uses is found in the automotive catalytic converter. The car’s engine exhaust passes through the catalytic converter changing environmentally polluting gases (e.g. NOx, CO and residual hydrocarbons) into more innocuous ones. (Well, they used to be more innocuous anyway until some clever person decided that CO2 emissions were problematic as well. But, I digress.) 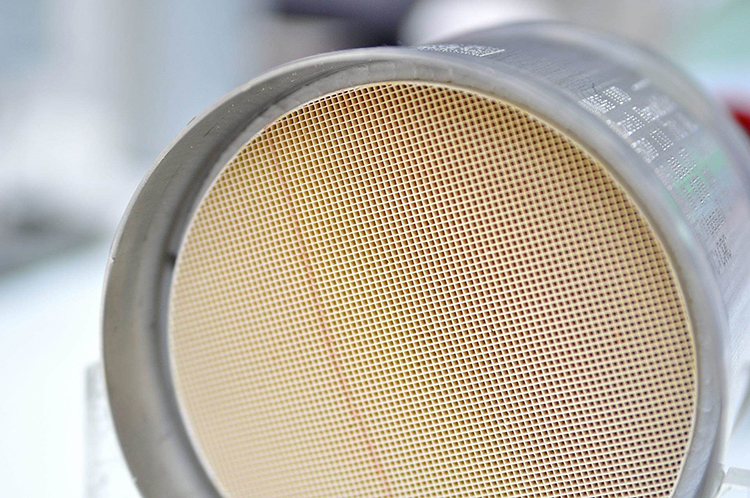 Some quick literature reading suggests there is a renewed interest in these for other areas of application besides automotive emission control. Ceramic monolith with hexagonal channels. Ceramic monoliths can be made from a variety of ceramics or minerals depending on the application. While it’s true in some cases that the ceramic material is inactive, there are reactions where the ceramic substrate influences the catalytic reaction. Hence, material selection is important. Application of the catalytic metals onto the monolith is another critical step which influences the overall performance of the catalyst. In one typical application process, the untreated monolith is dipped into a liquid slurry of catalytic precursors and then calcined to activate the catalyst. Ceramic monolith with square channels assembled in an external housing. The initial goal for Orbis micro-XRF analysis was to analyze the metal distribution within the channels of the monolith. The monoliths were cross-sectioned to expose the interior of a plane of channels and the starting question was to look at the distribution of applied metals along the length of the channels. This is easy enough to do and we can clearly see distributions as we measure from the channel entrance to the center of the channel. It’s what you would expect when dipping a narrow tube in a slurry. But, we could also see distributions across the width of the channel as well. It’s not something I immediately thought about, but it makes sense as the slurry pools in the corner of the channels where two channel walls meet. As we discussed the results we had so far, the question of quantification came up. (Questions about quantification always come up!) As we discussed quantification methodologies, I was measuring at different points within a single channel and noticed that light element signals from the substrate (e.g. MgK or AlK) were sometimes present in the spectrum and sometimes not. This was a surprising result as the belief was that the catalytic wash coat was thick enough to completely absorb these signals. So, we also learned that mass coverage of the catalyst treatment was not as heavy as expected and this also provided some valuable insight into how to go about quantifying the catalytic distributions within the monolith. If the Orbis micro-XRF analysis can provide data on how well the catalyst is distributed throughout the monolith channel, then this could potentially enable improvements in application techniques, which in turn may lead to dramatic improvements in catalyst efficiency. Overall, I thought that wasn’t bad for a couple of hours of instrument time!